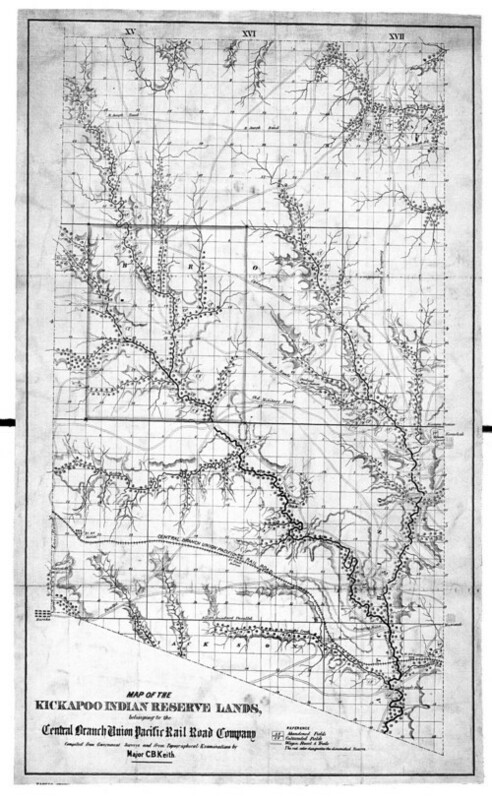 This detailed map of the Kickapoo lands in Kansas shows the location of military roads, railroads, settlements, Indian missions, rivers, wooded areas, and cultivated fields. Kickapoo lands straddled Brown, Jackson, and Atchison counties in Northeast Kansas. The map was compiled by Major C.B. Keith for the Central Branch of the Union Pacific Railroad. This detailed map will be visually appealing to students. This map, alongside other sources on the Kickapoo, could be grouped with maps showing all the Indian lands in Kansas to demonstrate a microhistory of emigrant tribes.